PinkyS were introduced at the 2005 American International Toy Fair in New York City (February 20-23). According to Ty, PinkyS were created for a very special little girl who loves pink. 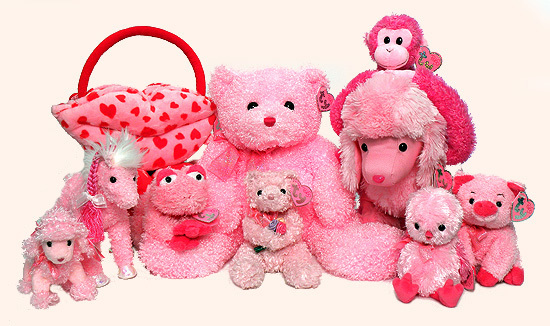 The PinkyS are made in various sizes that range from 3-inch key-clips to Beanie Buddy sized items. The family includes six different purses. To complement and promote the PinkyS, Ty sold a Pinky's Pack exclusively at the online Ty store. The Pinky's Pack included a Pinky Poo key-clip, baseball cap, T-shirt, light-up ballpoint pen and a PinkyS tote bag. The PinkyS pack was introduced on August 26, 2005. It has not been officially retired, but is no longer available at the online Ty store. The PinkyS were made in two categories; PinkyS and Beanie Baby PinkyS. 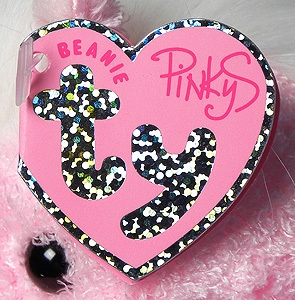 The Beanie Baby PinkyS can be differentiated from the other PinkyS on the front of their swing tags. These do not appear to have been different generations of tags but possibly attached to the plush products depending on the size of the product, with the smaller items getting the Beanie PinkyS tags and the larger items having the PinkyS tags. At tycollector.com we categorize the PinkyS as one product line regardless of the style of swing tag. It should be noted however, that some Beanie Baby reference guides in the past treated these as two different product lines. The most difficult to find Pinky seems to be the Jingle Beanie-sized Pinky Poo (no style number) that was given out to retailers who placed orders at the 2005 Toy Fair in New York City. Another Pinky more difficult for collectors to find today is Delights, who accidentally shipped with Beanie Baby swing tags and tush tags until the error was corrected. As of November 2017, there are only two PinkyS purses and one PinkyS key-clip still showing as "current" (not officially retired) at the Ty Internet site.